My sister and I worked very hard to cut and glue all of the crayons onto white paper. I didn’t get any pictures of the process. (Sorry about that.) I think I can still walk you through it! – Buy a frame and remove the glass. -Print out a giant letter. I outlined the font in Word so that I didn’t waste too much ink. -You can print the name below the letter or glue on another piece of paper with the name on it. -Use a sharp knife to cut the crayon. -Roll the crayon while pressing on the knife. -If the crayon doesn’t cut all the way through, snap it carefully. -Lay the crayons where you want them first. -Pick up one crayon at a time. -Once all of the crayons are in place glue the white paper to a piece of thin cardboard. Glue right behind the crayons to avoid the glue being seen. This made the picture feel much sturdier. That’s it. 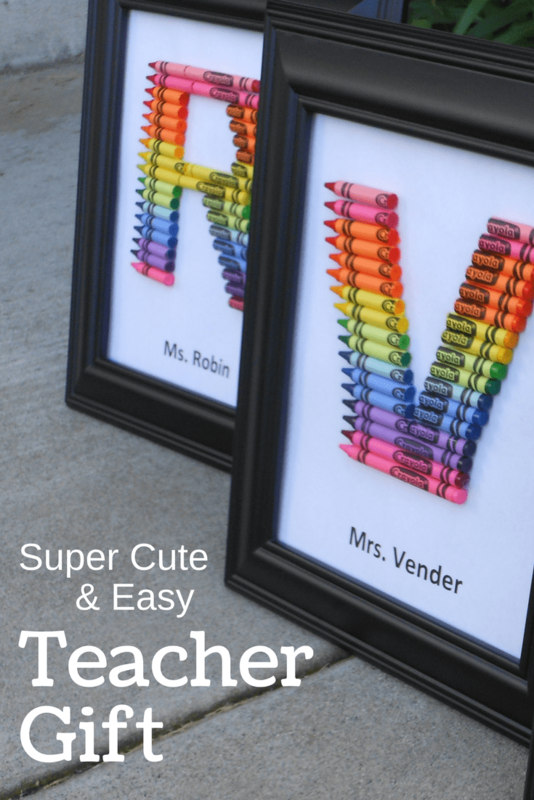 Wrap it up and hand over this adorable teacher gift. How did you show the Teacher love this year? 20 homemade gifts that will be used all year! Wow! Love it. It was an interesting and creative. Thanks for sharing this with us. Please keep it up. sure sure it’s a cute idea but what is a teacher supposed to do with this? i guess hang it in the classroom – but really? teachers appreciate practical gift cards as a gift – or just a simple thank you card- not more “stuff” to have to find a place for – imagine if every child gave a photo to hang? this stuff becomes cumbersome year after year – how about use the idea for a child’s room – please THINK before you make a teacher a “cute” gift. I appreciate your opinion. I was a teacher for 10 years. I loved receiving homemade “cute” gifts. In fact I still have some of them. Every teacher has different preferences and perhaps a gift card isn’t perfect for every teacher either. Maybe instead of ruling out a certain type of gift, thinking about the person you give it to is a better idea. Such a CUTE idea! I am a preschool teacher and I LOVE this! I personally love getting things like this because it shows that the children and / or parents really put some thought into it! I made something similar when my son was in school for his teacher. It was a crayon wreath. My daughter is now in Kindergarten and I am going to make this for her teacher. I honestly think that she would love it! Yeah Lisa! Love the crayon wreath idea! True! I have been a teacher for sixteen years, and while those gift cards have always been welcomed, it is the thoughtful unique gifts I cherish most. I made one of these two years ago for my child’s first grade teacher, Instead of just the name I put T is for Ms. Txxxxx and she loved it. She even asked me for directions so she could make it for her child’s teacher. So I guess its just a personal preference. I don’t agree. My mom was a kindergarten teacher for so many years and she would have loved the creativity and beauty of this gift. I love it too! 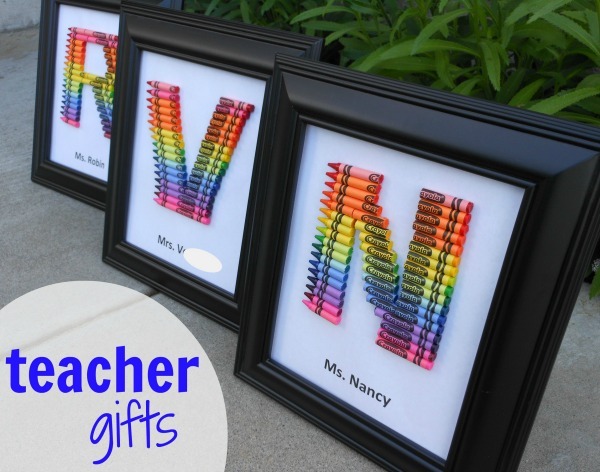 First year teachers for sure would love this, along with many other teachers who have a heart for a gift that took some thought and time to create. I actually did use hot glue. I can’t believe I didn’t write that, I’ll have to add it. Thanks! Thanks for the creative idea and sharing the steps in doing it. Just so you know, my middle school daughter is creative and she purposefully searched the internet looking for a present she could make her favorite teacher who is moving. She loves this! She is making this for him. 🙂 So it goes even beyond K and PreK teachers :-). Thanks. ADORABLE! What size font did you use and what size photo frame? Also, I’m assuming you used a shadow box-type frame?-Thanks! I can’t remember which font we used. I’m sure it was just a basic one. The frame was actually just frame. A shadow box would work well with this though. I was wondering how you go about doing the letter M.
Thanks for sharing this wonderful idea ! 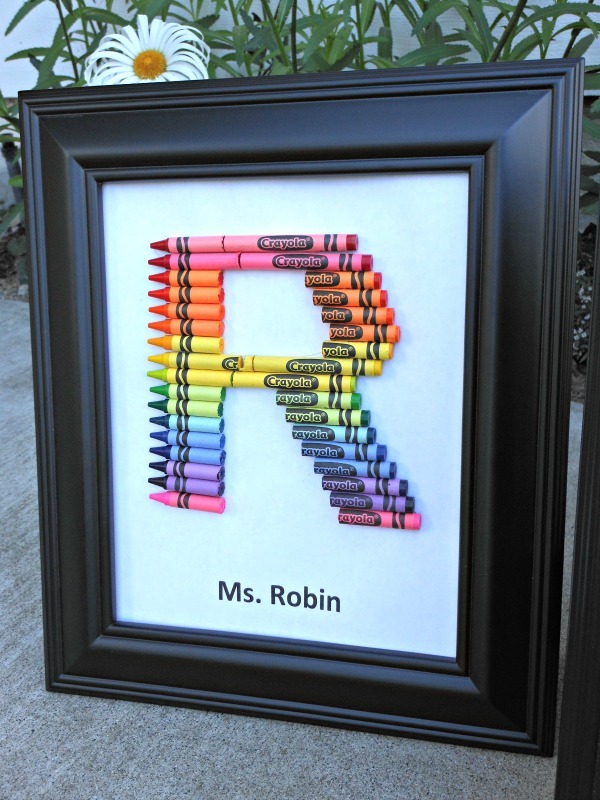 I am thinking about making one of those for my daughter’s teacher. Oh I bet she’ll love it! 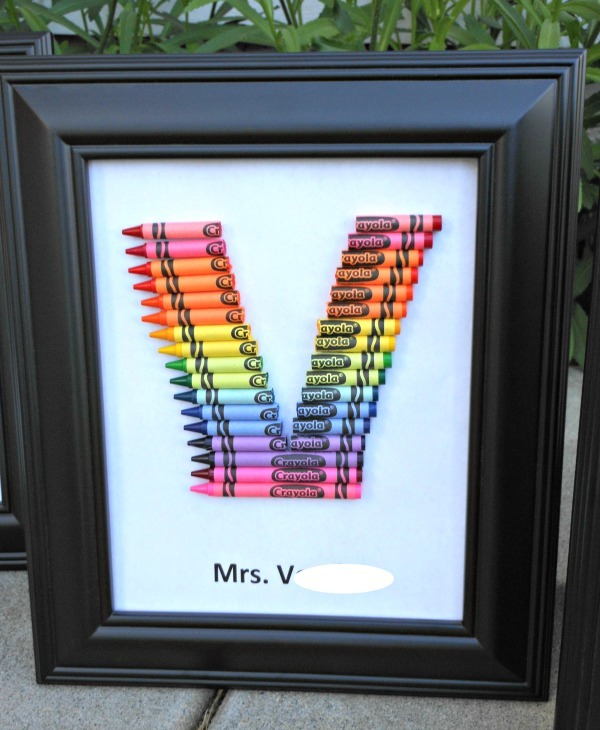 I LOVE this idea.. me and my son did this idea for his Teacher appreciation day… We did the V for Mrs Vasquez….. Thank you…. I was wondering if you would remember what size frames you used? Thank you. Those are adorable but I would like to know how to do this with the letter “S”. Thank you. Thanks Selena. You an use a word document to make a letter S the size you want. then all you have to do is follow the pattern. S might be tricky but you can lay out the crayons before gluing so you know how it will look its best. I just made one of these for my sons teacher and it’s adorable. I put it in the frame and I can’t get the backing on because the crayons are too thick. Please tell me what to do or what kind of frame I need to get so it will close! Thank you!! Great idea!! Hi! Did you take the glass out? The crayons should stick out the front and the back should then fit like normal. 🙂 Hope that helps. These are adorable but I would like to know how to do this with the letter “T”. Thank you. Here is my tutorial for the melted crayon art where I cut the crayons. Hi what size letter front did you use? 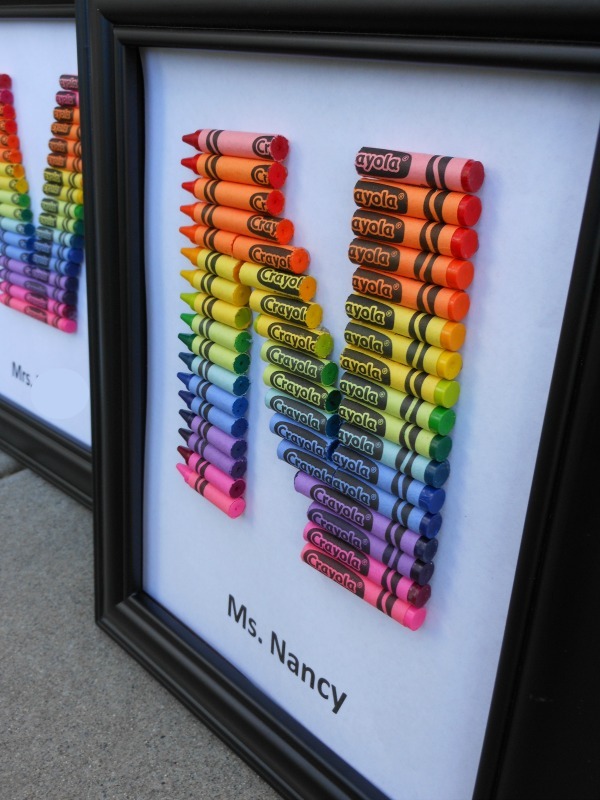 Do you make the framed crayon boxes and sell them? If so how much and how long does it take to get them? Nope, I just made them for gifts. Hi Jillian! I’m a freshmen in high school and I absolutely love this idea and I am planning on using it next year for teacher appreciation week for my high school Algebra 1 teacher. I just have two questions. What size photo frame did you use? Did you replace the glass back on the photo frame afterwards or just left it without? Thanks for taking the time to read this and answer my questions. Hi Hannah! We used an 8 X 10 frame and did not replace the glass. Thanks for the comment. Do you have an estimated guess on how many crayons you would use?? I’m super excited to make these! Just don’t want to buy more then I need. A box of 24 should be good. You might want to get to boxes though, just in case you make a mistake.